At the Connecticut Orthopaedic Institute, we are proud to provide an exceptional experience for our patients — delivering world-class care with the highest safety and quality. 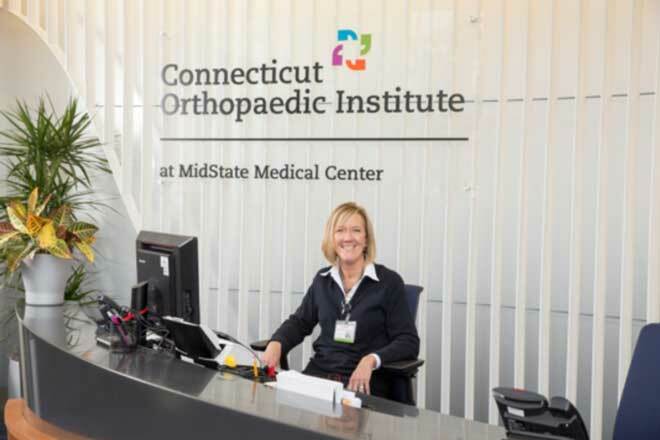 The Connecticut Orthopaedic Institute is staffed by renowned orthopaedic specialists who incorporate the best practices into the delivery of care at the institute. A team of leading specialists will provide you with a comprehensive view of the best treatment options for your orthopaedic problems, including the latest protocols, the most promising surgical techniques, and the fastest route to recovery. At 14,500 square feet, spanning the entirety of Pavilion A on the MidState campus, the Connecticut Orthopaedic Institute is essentially a hospital within a hospital. The Connecticut Orthopaedic Institute at MidState Medical Center consistently receives outstanding patient experience scores from Press Ganey, an industry leader in patient experience measurement. Responses from patients treated at the institute led to an overall score of 95, which was higher than 99 percent of the hospitals in the same group within Connecticut and nationally. Areas in which the institute excels includes the admission process, pain management, rooms, meals, nursing, physician communication, operating and recovery rooms, special services, and more. Our industry-leading length of stay for total hips and knees of 1.2 days is well below the national average of 2.6 days, as is our readmission rate of 1% when compared to the 4% national standard. Ninety five percent of patients are discharged home, demonstrating the success and efficacy of the best practices we have instilled here. Compared to peer groups within the state and nationally, the Institute is ranked in the 99th percentile for overall patient satisfaction and 99% of patients would recommend our institute to a family member or friend. CareGrams from family or friends can be sent through our website. The patient experience begins with the decision to undergo a procedure at the Connecticut Orthopaedic Institute. We take the patient from that point through their first year after surgery and make it a seamless, caring, safe, and educational process. Our nurse navigators reach out to the patients once surgery is booked, provide educational guidebooks, and schedule them for a pre-op class. Our preadmission center offers a one-stop location for pre-operative testing and evaluation. On the day of surgery, patients are greeted by a team of compassionate orthopaedic experts from anesthesia, peri-operative services, the PA staff, and our orthopaedic certified nurses. Working with physical therapy on the day of surgery has facilitated a quicker recovery to home, which is often the day following surgery. Our care coordination team, in collaboration with our nurse navigators, assist patients in their transition home by hosting a daily discharge class, providing durable medical equipment, and facilitating home care services. After discharge, our coordinated care continues as our nurse navigators follow-up with patients on post-operative days 3, 7, 14, 30, and 90. We have incorporated the best practices into everything we do at the Connecticut Orthopaedic Institute. A team of leading orthopaedic specialists will provide you with a comprehensive view of the best treatment options for your orthopaedic problems, including the latest protocols, the most promising surgical techniques, and the fastest route to recovery. Connecticut Orthopaedic Institute patients have access to the latest technologies, including precision Mako Robotic-Arm Assisted Surgery, Mazor X Robotic Spine Surgery, artificial disc replacements, and new approaches in anesthesia. Your collaborative care team includes orthopaedic joint reconstruction surgeons certified by the American Academy of Orthopaedic Surgeons (AAOS). Our teams meet on a regular basis to ensure continuous clinical improvements and the best results for patients. We will ensure you are physically ready for surgery and understand the possible outcomes of your surgery prior to any orthopaedic procedure. You will have a pre-anesthesia risk evaluation and all of the individualized care and attention you will need, including orthopaedic nurse navigators to oversee your care throughout the entire process. We do everything we can to make your orthopaedic surgery experience exceptional. The Hartford HealthCare system includes a vast and closely-knit community of care providers and partners. A comprehensive rehabilitation network provides any level of care you need, all within our own healthcare system. This enables a smooth transition to home through Hartford Healthcare at Home’s services or through a member of our post-acute care network. Additional services to transition to home are also available through our care partners, Hartford Healthcare Rehabilitation Services and Hartford Healthcare Senior Services. Learn more about the team that coordinates your care. The Connecticut Orthopaedic Institute is part of Hartford HealthCare, Connecticut’s most comprehensive health care network.